Why Does It Cost Almost $600 to Attend Public School? The United States ostensibly offers a free public education to every student who wants one. The reality is different. What you see above—originally published this week on Clashtalk, Gawker's community Kinja site, by an outraged parent—is part of a "fee slip" for a public high school in Park Ridge, Ill. (the full image is below). 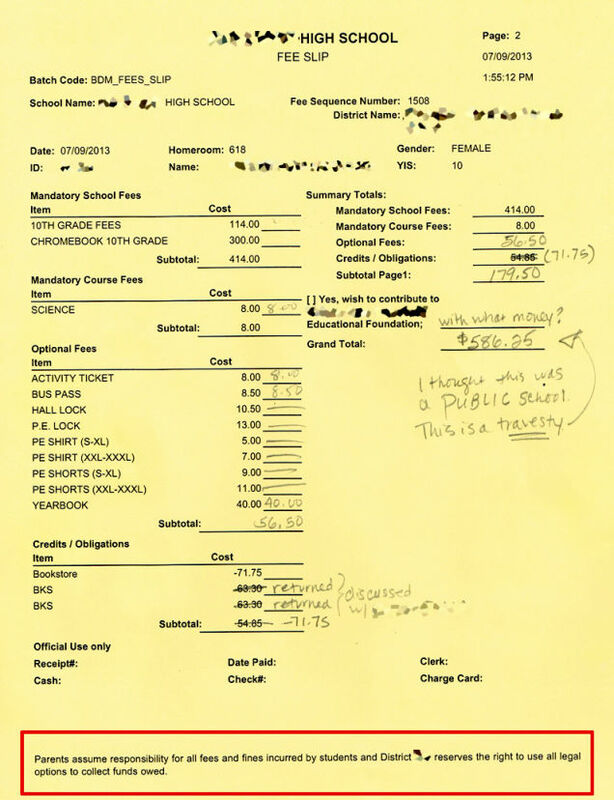 The parent in question owes $586.25 in mandatory fees for her daughter to attend tenth grade. Why? Perhaps the most notable charge being levied against public school parents in this district: $300 for a Chromebook for each student. A mandatory Chromebook. In an online FAQ on this subject, the school district—Maine Township, which pulls in students from Park Ridge and Des Plaines, Ill.—says that students must buy a Chromebook even if they already have a laptop or other computer at home. 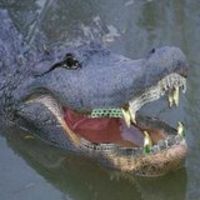 It justifies the expense by saying it is "a cost point that could easily be offset by replacing select print textbooks with electronic books and eliminating the requirement that students purchase a scientific calculator, resulting in a cost savings for families over their high school career." Note the use of the word "could." This particular student already has a laptop, but still has to buy a Chromebook. The parent in this case tells us that "the Chromebook was touted as a way to allow students to purchase e-books instead of hard copies, thereby cutting down their load and making things oh-so-efficient." Except that many textbooks aren't available as e-books after all, meaning parents are forced to purchase both the computer and the more expensive hard copy books. Students who are poor enough to qualify for free lunches see the cost of their Chromebooks waived; everyone else has to pay the full price. Additionally, insurance for the Chromebooks, starting at $30 a year, comes out of the parents' own pockets. Add in more than $100 in anonymous "1oth grade fees," and extra fees for science lab, bus passes, P.E. class, a yearbook, and textbooks, and it all adds up to a nearly $600 price tag for attending a public school. Fees levied on parents of public school children have been used for years by cash-strapped school districts, either to fill basic needs or to acquire what might be considered educational luxuries. The practice is not without critics. In 2010, the ACLU sued the state of California over its public school fees, and abandoned the suit only after California Gov. Jerry Brown signed a law making it easier for parents to dispute those fees. Similar uproars have broken out from coast to coast in the past several years. Yet this Illinois example seems more egregious than most, since it is not composed primarily of optional fees for extracurriculars, but of mandatory fees required to simply attend regular classes—fees that are required of all but the poorest parents. In 2011, the Wall Street Journal marveled at the fact that "At high schools in several states, it can cost more than $200 just to walk in the door." Two years later, we have an Illinois fee slip approaching three times that amount. 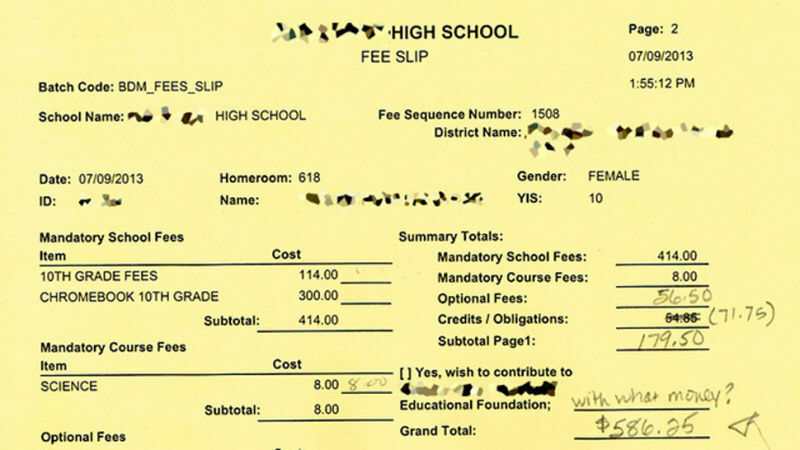 The bottom fee slip notes, ominously: "Parents assume responsibility for all fees and fines incurred by students and [the school district] reserves the right to use all legal options to collect funds owed." What does that actually mean? What if a middle class parent, perhaps making just above the amount necessary to get these fees waived, simply refused to pay $600 in order for their child to attend public school? David Beery, the communications director of the Illinois school district in question, reiterated the rationale that, by the district's calculations, buying a Chromebook would save a student money over the course of four years. He said that the district would talk with any refusenik parents on a case-by-case basis and "see what we can work out." But formally speaking, there's no way for parents to escape these fees. Welcome to public school, 2013 style. That'll be $586.25.